Applying tiny plastic covers to cat claws isn’t the easiest thing to do. I prefer simply trimming the claws, but sometimes that’s not enough. 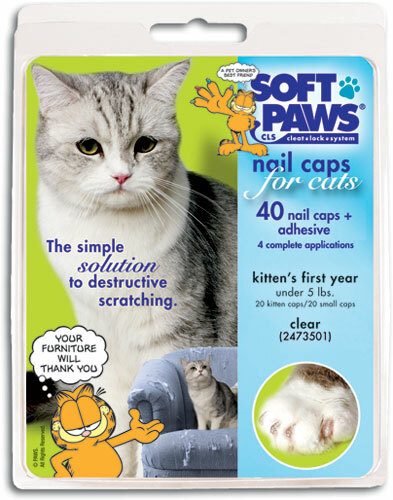 Soft Paws need to be re-applied every 4-6 weeks. Try the brightly colored Soft Paws, because you can easily see if they’ve come off. The elderly, people with health conditions causing thin skin or bleeding problems, small children, cats with health conditions causing thin skin/bleeding problem/chronic itching/OCD issues, aggressive cats, households with antique furniture, cats that bat their owner’s eyeballs, cats that get stuck to the rug. *Thanks to cat groomer Beth Cornell Rex for this description of who should and shouldn’t use Soft Paws. Next Stuck at home? Brush your kitty!